The Muddy telescoping multi-hanger is designed for easy use and storage in and out of the field. 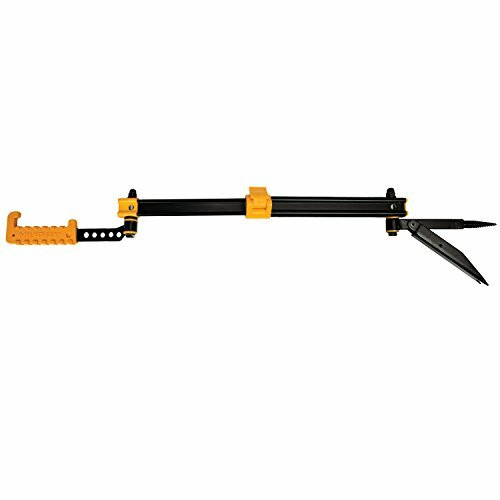 Constructed of aluminum and steel, the telescoping multi-hanger includes a leg grip for extra strength, the ability to fold flat for easy storage and packability, and is easily installed with a screw-in steel tip. Ranges in extension from 7.25" to 21.5" and folds down to 8.75" for storage. Includes a gear hook coated with non-slip rubber coated grip. The hook arm adjusts 360 degrees. Weight rated at 30 lbs.